Oakland somatic therapist Allison White said she was “so deeply sad” about the election that she felt she needed to do something about it to heal her mind, and her body. She regularly walks around Oakland’s three-mile Lake Merritt, considered a “jewel of the city,” and talked to a handful of like-minded liberal friends about putting together a peaceful, therapeutic event for the community to join and heal. On Wednesday, she posted a public Facebook invitation for anyone to show up at the lake to join hands on Sunday afternoon. “We all need to be accepting of each other,” White said of wanting to bring people together to heal, not to fight or protest or break windows of shops, which has been a recurring theme in some recent anti-Donald Trump protests in Oakland. Her friend, Svieta Lana, said that one of their friends figured out they’d need 3,600 people to show up to complete the circle around Lake Merritt, situated between the county court house and the iconic Grand Lake Theatre. Though the exact number wasn’t tallied, the event’s Facebook page showed that nearly 8,500 people said they attended the affair, which was billed as an event to stand up to "racism, sexism, homophobia, and Islamophobia." Lana thought there might have even been 10,000 people there, as many brought children and friends, too. 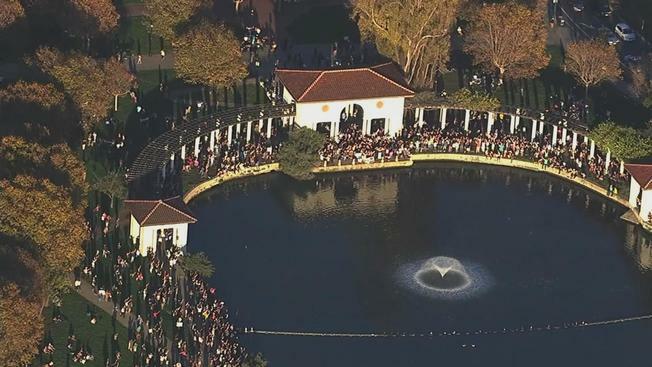 Oakland police did not immediately know how many people attended, the event, but an aerial view on Sunday afternoon showed the entire ring of the lake was ringed with people, sometimes two or three people thick. Around 4 p.m., people grabbed hands and shot them high into the air. Before the main event, an "empathy tent" was set up for anyone who wanted to talk, and children flashed "Free Listening" signs for those desiring an open ear. A group of psychotherapists belonging to the group "Sidewalk Talk" were also on hand to listen to concerns in a neutral fashion. Many on the right bashed this idea on social media, laughing at "liberals" for their touchy-feely approach to life. But those who organized it felt the tents were important. "I feel that marginalized people are going to feel the impact of this election differently that privileged folks because they are terrified about their safety," Traci Ruble, psychotherpaist and CEO of Psyched in San Francisco said.